Numero Group’s most recent release Warfaring Strangers: Acid Nightmares, documents an oft-overlooked and intriguing part of the psychedelic era. This came after the optimism of the hippie movement came to a sudden end. Gone was the hopeful, positive and sunshine psychedelia. In its place, was a darker and much more abrasive and lysergic style of music. Sometimes, there was a paranoia to the music, as if the hippie dream was now a nightmare. Sadly, it was for some. There were many who were ill-suited to L.S.D. and other hallucinogenic drugs. Many who had decided to turn in tune in drop out were now acid casualties, and were a shadow of their former selves. This would include Roky Erickson of The ‘13th’ Floor Elevators and Sid Barrett of Pink Floyd. Just like Icarus, they had flown to close to the sun, and never recovered from their ill-judged dalliance with hallucinogenic drugs. Many singles and albums released during the psychedelic era were only vaguely psychedelic. That was no surprise, as there had been a lot bandwagon jumping going on during the psychedelic era. Especially groups trying to revive flagging and failing careers. Their last hope was to reinvent themselves as a psychedelic group and enjoy one last payday. Meanwhile, many unknown groups were releasing some of the most psychedelic music that was released during the sixties and early seventies. These singles and albums were often released in small numbers as private presses. Nowadays, these singles and albums are incredibly rare, and exchange hands for ever-increasing sums of money. This includes the eighteen tracks on Warfaring Strangers: Acid Nightmare, which includes some of the darkest, most abrasive and lysergic music during the psychedelic era. They were proof that that the hippie dream was well and truly over. The music on Warfaring Strangers: Acid Nightmare also hints at the music that would follow in psychedelia’s footsteps over the next few decades. 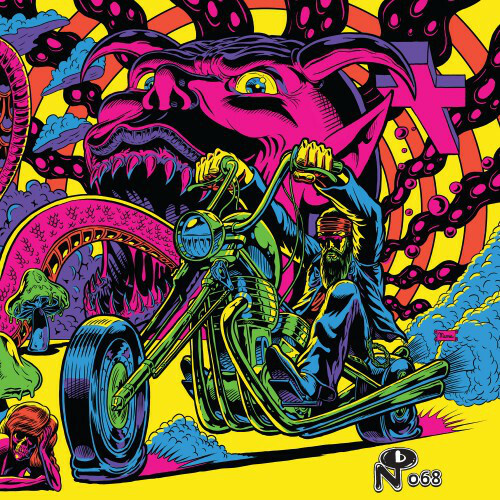 There’s a nod towards heavy metal, grunge and stoner rock on Warfaring Strangers: Acid Nightmare, which are akin to a template for these genres. Each of these genres roots can be traced to some of the tracks on Warfaring Strangers: Acid Nightmare. They’re a reminder of true psychedelia, not the sanitised version peddled by bands on their last legs or record labels trying to make a quick buck. 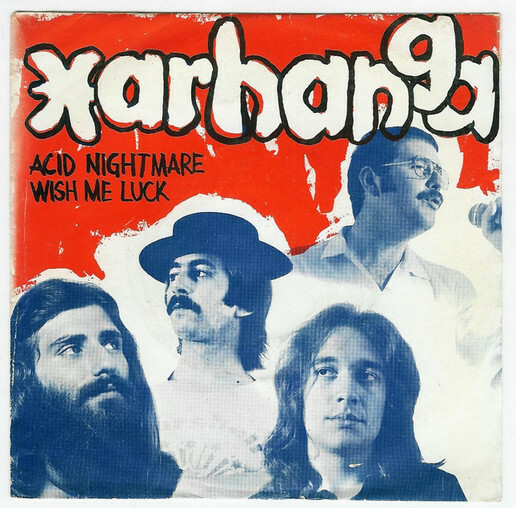 Opening Warfaring Strangers: Acid Nightmare is Xarhanga’s 1973 single Acid Nightmare. It was released on the Portuguese label Zip Zip, which was named after a well known television show. On Acid Nightmare, Xarhanga showcase their unique brand of lysergic, hard rocking sound. Sadly, Xarhanga only released a couple of singles and never got as far as releasing an album. 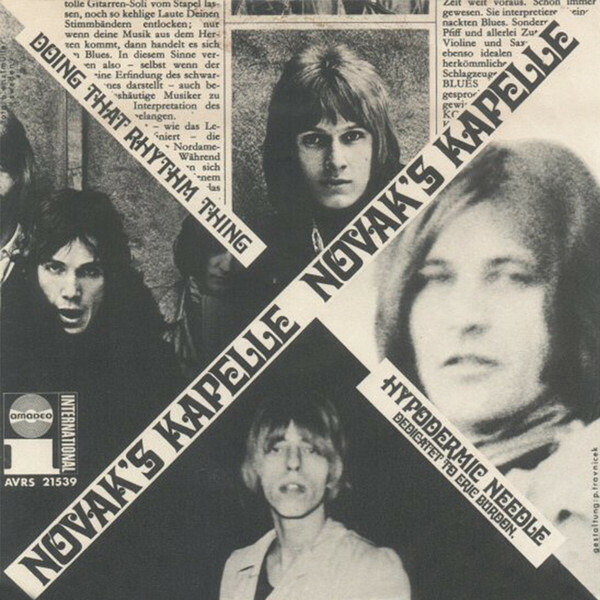 In 1968, the Vienna based band Novak’s Kapelle released Doing That Rhythm Thing as their debut single on the Austrian label Amadeo. Tucked away on the B-Side was Hypodermic Needle a blistering and raucous fusion of garage rock and psychedelia that is impossible not to like. This was the start of a recording career that lasted eleven years and saw Novak’s Kapelle released one album and four singles. As the seventies dawned, and the hippie dream was over, a new breed of psychedelic bands emerged. This included Whistlers Mother, who were a tight and talented band. They released Dark Dawn as a single on Multi Records, in 1970. It features a dark, abrasive and lysergic sound that is antithesis to the hippie dream of a few years earlier. There’s also more than a hint of the stoner rock sound that would find favour with music fans further down the line. To publicise the 1971 Hartlepool Rock Festival, the short-lived Abreaction label released an EP that featured four of the bands on the bill. Opening the EP, was Brass Alley, who contributed Pink Pills. It was penned by Ken Mountain,who produced the songs with Ken McKenzie. From the opening bars, it’s apparent Brass Alley is another talented band, and one who should’ve gone on to greater things. Although lysergic and hard rocking,Pink Pills is melodic a reminder of all that is good about early seventies hard rock. Gift were a West German group who started life as Phallus Dei, which was also the title of Amon Düül II’s 1969 album. 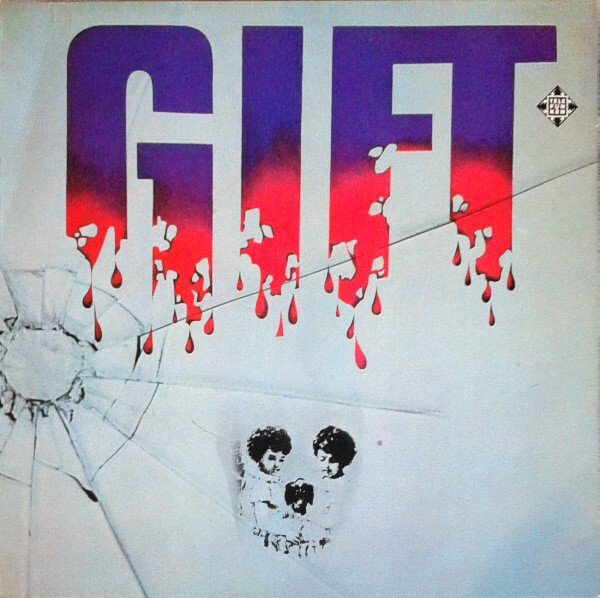 However, Phallus Dei decided to change their name to Gift around 1969. This was a less controversial name for the band who released their eponymous debut album three years later on Telefunken in 1972. Opening the album was Drugs a blistering and progressive hard rocking track from one of the early Krautrock bands. Acid was a German heavy rock band from Heidelberg. They were formed around 1975 and four years later, released their one and only single Acid. It was released in 1979 on the Frankfurt-based Stall-Studio which was owned by engineer Michael Unger. Straight away, Acid has a slow, dark and moody sound. Soon, the tempo builds and there’s a slight progressive sound to this long-lost heavy rock single. During the early seventies, Sardonicus was regarded as South-East London’s top rock band. The four piece band cut Nymph as a single for John Martin’s County Recording Service label in Binfield, Berkshire in 1973. Hidden away on the B-Side was Evaporated Brain, which is an intriguing genre-melting song. As guitarist Valentine Pascal lays down some chiming guitar licks, while Chris Rance’s vocal is part garage rock part proto-punk. Three years later, and this vocal style would de rigueur. Chris Rance was ahead of his time on this genre-defying track. When Mass Temper entered the studio to record a demo in 1968, one of the tracks they recorded was Grave Digger. Since then, this demo has featured on several compilations. It’s best described as proto-metal and was a taste of the music that was to come in the late-sixties and early seventies. 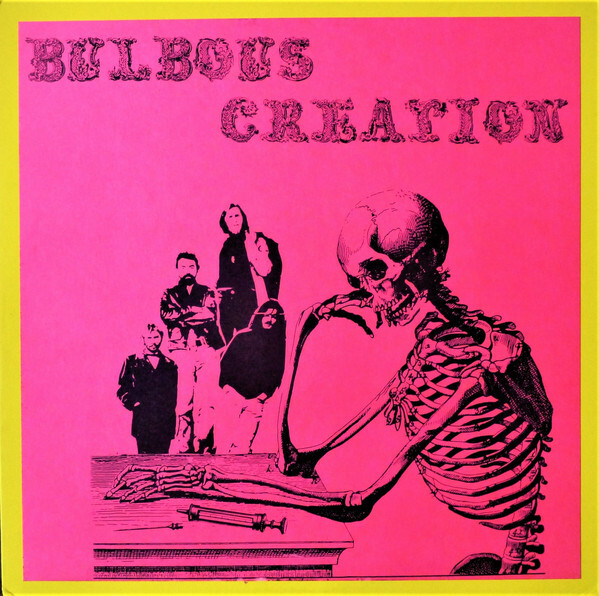 Bulbous Creation was an acid rock band from Prairie Village, Kansas. They recorded their debut album You Won’t Remember Dying in 1971. Sadly, the album wasn’t released until 1994 when it eventually made its debut on the Dallas based psychedelic label Rockadelic Records. One of the highlights of You Won’t Remember Dying was the dramatic and moody sounding Hooked, which features the acid rockers at their very best. The Ritual were an American band who released a couple of singles in the late sixties and early seventies. Speed Freak was The Ritual’s debut single and was released on the Hastle label in 1969. Although The Ritual were essentially a psychedelic band there’s a progressive sound to Speed Freak. Despite their undeniable talent, The Ritual only released one more single, and never enjoyed the success they deserved. Purple Sun is one of the many bands who only ever release one single. Their single was Doomsday which was released on the short-lived Rampart Street label in 1970. Doomsday finds Purple Sun fusing psychedelia and hard rock. Later, there’s even a hint of grunge as Purple Sun continue to strut their way through the track. Sunn Cycle’s Acid Raga closes Warfaring Strangers: Acid Nightmares in style. It’s no exaggeration to say that the compilers have saved the best until last. Acid Raga epitomises the late-sixties psychedelic rock sound. It finds Sunn Cycle fusing psychedelic rock and Eastern influences on Acid Raga. Playing a leading role in the sound and success of this long-lost psychedelic rock hidden gem is a Hendrix inspired virtuoso guitar solo. Sadly, when this Chuck Taylor production was released in 1969 by Spectrum Records who were based in North Carolina, it failed to find the audience it deserved. Now forty-seven years later, and Sunn Cycle’s Acid Raga ensures that closes on a high. Warfaring Strangers: Acid Nightmares is the latest lovingly curated compilation from Numero Group. It’s another compilation that is all killer and no filler. That takes some doing on a compilation that features eighteen tracks. However, Numero Group dig deeper than many of their competitors and have unearthed a myriad of a long-lost hidden gems. They’re a reminder of an oft-overlooked period in the psychedelic rock era. During the period Warfaring Strangers: Acid Nightmares documents the hippie dream was but a distant memory. Gone was the hope and optimism of a few years earlier. The flower children had grown up, and moved on. So had music. Gone was the hopeful, positive and sunshine psychedelia. In its place, was a darker and much more abrasive and lysergic style of music. Sometimes, there was a paranoia to the music, as if the hippie dream was now a nightmare. Sadly, that was a case for many who had become acid casualties. This was one of the realities that became clear when the psychedelic party came to sudden end. The music on Warfaring Strangers: Acid Nightmares is a reminder of this period. This is a part of the psychedelic era that many writers and compilers have conveniently overlooked. Partly, because it doesn’t fit their idealistic portrayal of the hippie dream and psychedelic era. They’ve convinced themselves and others that the second half of the sixties was a musical nirvana, where peace, love and spiritually mattered and neither consumerism nor capitalism were important. Somehow they’ve managed to overlook the bad music and bad drugs that resulted in many acid casualties. They’ve also managed to forget that most of the yogis and gurus were charlatans, only in it for the money. So were many of the musicians who jumped onboard the psychedelic bandwagon looking for a quick buck. By the early seventies, which Warfaring Strangers: Acid Nightmares covers, many of the hippies were different people. They were now well on their way to becoming the people they once despised…breadheads. No longer had they any interest in psychedelia, despite the genre being alive and kicking. Psychedelia by the early seventies was evolving. It had to. If it stood still it risked becoming irrelevant. As a result, many of the new breed of psychedelic bands were taking psychedelia in different direction. That is apparent on Warfaring Strangers: Acid Nightmares which shows a very different side to psychedelia. It’s not just dark and abrasive, but moody, broody, dramatic and always lysergic. The psychedelia on Warfaring Strangers: Acid Nightmares is far removed from the vaguely psychedelic music that the bandwagon jumpers looking for one last payday produced. Instead, the music on Warfaring Strangers: Acid Nightmares is authentic and is always lysergic, and is the perfect addition to any collection of psychedelia. Hi Derek, I have just read your review of the Acid Nightmares compilation and was pleased to see you gave Evaporated Brain by Sardonicus a favourable mention, I was lead singer in that band & I also wrote the lyrics to the song, thank you very much you made my day. Glad that you liked the review and that it made your day. I thoroughly enjoyed the Acid Nightmares compilation and hope there’s a followup. There’s so many good tracks, including Sardonicus’Evaporated Brain. Was that the only single Sardonicus released? It’s all I could trace, and was wondering whether the group released any more music? Good to hear from you. Hi Derek, We did record four tracks during our recording session at Chappell Studios but the other two were ditched. We did not release anything else, we lost money recording & releasing this record so another was not an option for us. Once again thanks for your terrific review. Regards, Chris. Thanks for getting back in touch. Often when I write about a band on a compilation, I’m left wondering if they released any more music? That was why I was so interested to find out what happened to Sardonicus after the release of Evaporated Brain. Sadly, many bands lose money on private presses. That is the often the case, and bands are left with lots of unsold singles or albums. Ironically, often, these singles or albums now change hands for large sums of money. Maybe in the future you could license the two unreleased tracks for a similar compilation? Especially if Numero decide to do a followup. That would allow you and the rest of the band to recoup some of the money. Thanks for letting me know what happened to Sardonicus. Hi Derek, you might be interested to know that this album has been Grammy nominated in the category ‘Best boxed or special edition package’ , results announced on 28/01/18.